First off, shout out to Graham over at Recording Revolution pointing out some of this in his "plugin sweet spot" video, which you can only get as a subscriber to his site. When I watched the video I was like "Damn that makes sense and it's exactly how a DJ mixer works." 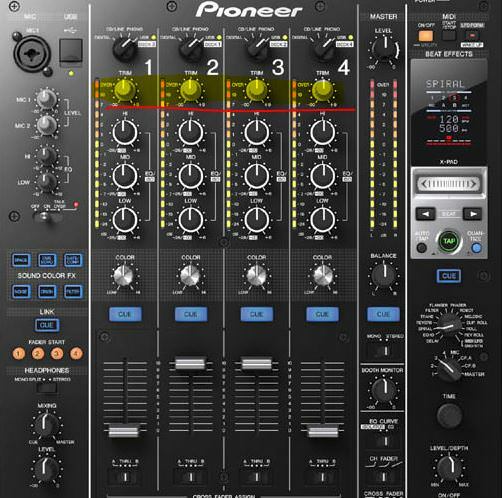 And if you never used a DJ Mixer, no worries they're pretty easy to understand. So here's what I have for you in this post. Want to improve your mixing so your productions sound big, crisp, and clear? I'd think so. Then you need to understand gain-staging. What the heck is gain staging? Basically it's making sure audio is controlled so that noise and distortion is not introduced. You can think of it as steps in the process where audio levels are brought down or boosted. Most people using DAW's today don't realize they need to pull levels down - A LOT. Most recordings are too hot. Most audio in sample packs are also recorded too hot. Why? Because every one thinks louder is better. If you buy a sample pack and the samples aren't loud enough, then they must be weak, and if they are weak they are whack. "Well so what? I can just lower them by pulling the fader down in Pro Tools yo!" Technically you can, but it's just not that simple. You see, when you pull the fader down in Live (or your DAW) you're just adjusting the volume of that track. Like the volume you as the producer would hear. It's exactly like the fader on a DJ mixer. The fader in your DAW, no matter if it's Ableton, Protools, Logic or Studio One only controls the listening volume. It does not control the level hitting the fader. And that's exactly the same as a DJ mixer. The fader controls what the audience hears. The gain or trim knob can be adjusted to increase or decrease the amount of volume BEFORE it hits the fader. For example songs are mastered at different levels, so you can use the trim knob to even them out. Keep in mind that trim/gain knobs control the level before they hit the fader. Because tracks in your DAW like the one below are too loud. My kick is peaking at -2dB. If this were an analog console that would be OK but since it's digital we have to bring it down. What we want is to bring the level down to an ideal range before the signal is fed into say a compressor or the first plugin in your chain, perhaps an all in one channel strip. So what is the ideal range? -12 to -18dB. That's way lower than I ever thought. "If you take the sound with the highest peak levels and set it so that it peaks at between -12 and -18dBFS, you shouldn't run into problems with plug-ins or summing on the mix bus." When you start mixing (if you're smart about your time this is a separate stage from say creating and arranging) you need to insert a trim plugin and pull the signal down to the ideal range before you adjust levels and insert plugins. What About Dynamic Range in 32 Bit DAWS? Some people think that modern DAWs offer near limitless headroom because of 32 bit float. Because of that there's no reason to worry about clipping channels and if your master fader is too hot, one can just pull it down. So I figured I'd check in with a pro. Here's what Nicky Howard, owner of The Fat Mastering had to say. "Eric, you’ve hit the nail on the head. It should be basic knowledge that channel processing takes place before the level meters, you should therefore start with a signal that's not overly-hot into your processing (Signal>Processing>Level). Red you’re dead, not very often something sounds good when driven hard in the digital domain. On the opposite side - when driving some analogue gear hard it can take on a whole new, very often pleasing sound. 32-bit floating point does offer allot more headroom & margin for error when exporting, however if you’re using this as a crutch to stop everything maxing out, it’s probably time to go back to the mix." These days plugins are great, but they don't do as well as analog gear does with hot signals. And again, most tracks (samples, audio rendered from synths or VSTs) prior to mixing are too loud/hot. Digital plugins and DAWs can't handle the heat like their analog counterparts. Basically they distort or cause noise - especially ones by known developers that emulate analogue gear - Slate, Waves, and UAD. The other reason is that you free up headroom on your master fader. When you send a track off to mastering you have to leave room for your engineer to work. And pulling down that master fader is not the way to do it. If you want your mixes to sound open, clear, and dynamic you have to start with appropriate levels. Keep in mind that trim/gain knobs are standard on DJ mixers they are NOT standard on the channels in your DAW. So what you have to do is insert a gain/trim plugin before you start mixing and adding plugins. "I really liked the tip the start with -12 / -18 db in ableton. My mixes are a lot clearer now! i also tried landr. and i think it is great. I played my tracks at a gig last weekend and they where sounding loud en equal to beatport releases!" And yeah I do think that when you're starting out and don't yet have a go to mastering engineer Landr is a great tool to use while you perfect your mix and "car check" prior to sending the final mix to a human professional. Lowering your input gain on tracks to the ideal range will help your mixes and your final masters. Notice that in Ableton, you have to expand the channel horizontally to see the numbers vertically. By default Ableton does not show that so go ahead and widen those mixing channels and insert the stock "Utility" plugin. If you're not using Ableton Live I'm sure there's an equivalent in your DAW. For more powerful, easy to understand tips like this, plus insider only production tips, sign up today using the form on the top of this page.